The whole construction project has become reality now! 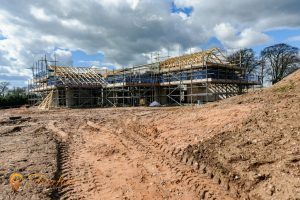 We’re coming ever nearer to the time when we will actually be riding in the indoor arena or sipping coffee and eating cake in the visitors’ centre. The pace of construction really stepped up after week seven when we started to see the shape of the windows and doorways. It was a milestone week when areas of the exterior block work were finished up to roof level and the builders moved inside. 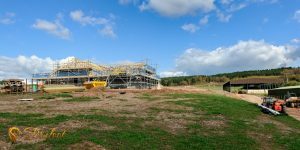 It wasn’t long before the roof trusses were delivered, soon followed by the steel and in the weeks that followed work was progressing nicely and the visitors’ centre grew and grew. The last of the trusses have now been fitted and hopefully in the next week work will start on the roof itself. The next exciting stage of the construction project will be when the windows go in and the external cedar wood panelling is fitted. My interior designer friend has been to visit. Her vision for the building is the same as mine and we had a good look at things, like how the reception area will be designed and working out what is going to be in the kitchen. Meanwhile, over at the arena, work has been progressing rapidly! The gable end panelling has been completed and the side panels have gone on and are being painted to match the rest of the building. I am happy that I decided to go with a covered arena rather than an indoor, we have beautiful views and it is a shame to block it all out! Just imagine having a schooling session with views of Cannock Chase. Things keep getting more exciting by the day, I am really looking forward to the next stages of the project!